- an event resource costing system. A full explanation of how your computer works: memory, processor, hard disc, networks, the Internet, and the World Wide Web. It includes details on how to protect your data, and how to avoid virusses and other malicious software. 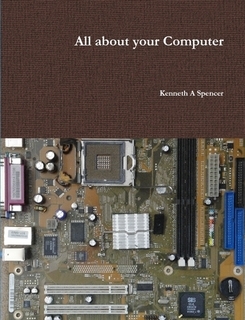 This book does not explain how to use your PC (there are many that do that) but rather how it all works. If you are a keen user who wants to know how it all happens, then this book is for you! A fully featured accounts system for the small business. Purchase, Sales & Nominal Ledgers. Invoices, Receipts, Reports. Multi cost centre, multi currency. A remote access Web Interface via a Web Server is available for this package. A package for costing all kinds of work from restaurant recipes, building and construction, all kinds of standard and bespoke designs, fabrics and materials. Provides invoices and quotations based costs and markup. If you sell using a sales force team, this package will help you keep track of performance, as well as recording your sales, warranties and other details. A remote access Web Interface via a Web Server is available for this package. If you are a company which sends operatives out to perform work on client sites (e.g. property maintenance, repairs, building contracts) this application package will help you keep track on work, and maintain invoices and reports. Keep track of your staff leave/holiday/absence/pay scales/qualifications and your company structure and lots more with this Personnel Record System. A Conference and other Event Management package for any organisation which runs or holds meetings or conventions of almost any size. If you run a Mobile Home Park, and you need help managing the charges, the electricity and other facilities for which you must charge, this package is for you. "Where did I read that article"
"Have we got a copy of that regulation in our library", or "Where will I find information on that subject?" JISys answers all of those questions as it allows you to record and index the keywords of books, journals, "grey" literature, and then to search the index. If you provide a service of loans or hirings of equipment to individuals or organisations, this package will help you with that function. If you provide resources, be they human, technological, security or logistical or any other, to organisations to support their events, conventions, or other activities, then this package will help you to ensure that you maintain proper tracking, and recovery, of your costs. This site, and its contents are copyright K A Spencer (Software), from June 1996 on. No part of this site may be used elsewhere without permission in writing.